Allow to cool & grind with raw rice. 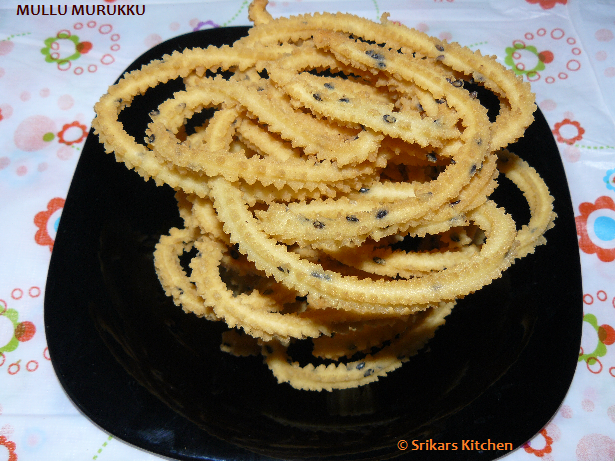 Sieve the flour & do this process 3-4 times.this is murukku flour. 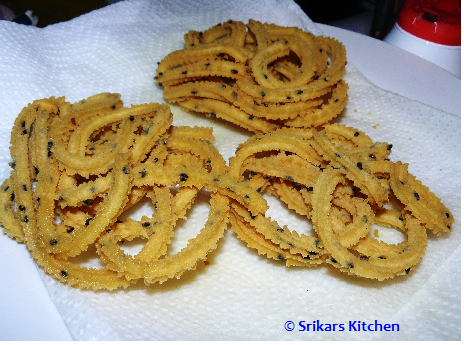 In a bowl add murukku flour, butter,salt, hing, sesame seed & mix well. Add water slowly & make a soft dough. Put one handful of dough in the murukku dough dispenser. Take a flat spoon, squeeze the dough on it & deep fry on a medium flame. Take it out and rest in a colander or paper towel. Allow to cool & keep in a air tight container. MuLLu MuRukku Superb ! Thanks for sharing !! WISHING YOU AND YOUR FAMILY FOR A VERY VERY HAPPY DEEPAVALI. BEST WISHES FOR HAPPY DEEPAVALI.